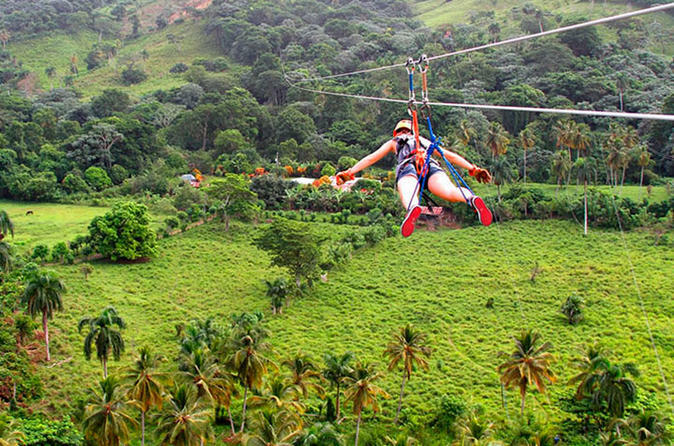 Ride a zipline, take a free fall and swing through the forest canopy during this eco-adventure from Punta Cana. Zoom down 3 ziplines in the Oriental Mountain Range, then take a hike through the tropical rainforest to the Extreme Swing. Get suited up, walk the plank and free fall 80 feet (24 meters), swinging like Tarzan at the end with views of the surrounding mountains. Hook on to a Superman-style zipline where you're suspended by arms and legs and zoom off once again before catching your breath, eating a light snack and returning to your hotel in Punta Cana.